This is RotorFlow® in its most basic form -the RFI visual flow indicator- a bright orange rotor turning with fluid flow. Simple, direct and reliable. Flow rate is estimated, or simply confirmed, by viewing the speed of the turning rotor. Either port may be used for incoming flow, and bayonet mounting lens is easily removed for quick clean out. 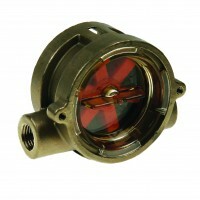 RFI Type RotorFlow® visual flow indicators are easy to see, easy to install and easy to afford.